As you can see I am not the skinny chic writing about how to look thinner. I can’t believe I am posting this awful picture (no critical comments allowed) but I am trying to make a point about “Faking Skinny.” Your clothes can accomplish this “faking skinny or thinner by dinner” with no dieting involved. Let me make something clear though, you are not going to look a size 2 when you wear a size 12 by wearing the right clothes but you can look 10 pounds lighter by purchasing clothes that is flattering on your body type. I will never be that person who can eat like crazy and not gain a pound. I will always have to eat healthy and exercise in order to maintain my weight. I will never have a fast metabolism, I didn’t have it at 15 years of age and I sure don’t have it now. I have come to terms with my body type and though there are things I can do to change it, I must first learn to accept it, with all of its flaws. I don’t always love my body and that is okay. Even though I have come to terms with my body I have my moments. For example, when I moved to South America and I walked into a mall for the first time to purchase a blouse, I was shocked not just by the price tag (clothes are expensive here) but also by the sizing standards. I was not feeling so accepting of my body in the dressing room when I couldn’t fit into my usual small-medium. For the most part, people here are tiny with small body frames and not very curvy. I cried as I tried on a large shirt and I could barely fit into it. Dieting and exercise are great formulas and I have been a slave to this for most of my adult life. Trying to maintain a healthy diet and exercising regularly is exhausting and sometimes I don’t have the energy so “faking skinny” has worked the best for me. These tips will help you minimize the problem areas and help you feel better about your body type by accentuating the beautiful and hiding the not so flattering areas. I have had to follow these tips all of my life and have added some along the way as I discovered what is flattering and not so flattering for my body type. Sometimes I am not so successful at it especially if there it’s on the sale rack (picture above is proof) but for the most part I try to find clothing that is flattering for my body. 1. Stay clear of clothes that is too loose everywhere. Don’t hide under a tent or wear bulky or boxy clothes. 2. If you are trying to hide a problem area don’t draw attention to that area with busy prints, colors or embellishments. 3. Don’t wear high-waisted or low rise tight pants, if you have a thick waist area. What you end up with muffin tops. 4. If you have wide thighs or don’t want to draw attention to your hip area don’t wear skinny jeans. Wear jeans with some flare at the bottom which create an even look throughout your body. 5. Buy the right size. Avoid clothes that is too tight it will show all the love, that is love handles. That was my mistake in the picture above. My white pants were too tight around the waist and they are also high-waisted pants, therefore, creating a bulge. Since the shirt was fitted it was hugging all the love. In the next picture, I am wearing the same shirt but the brown pants I have on are loose and have a lower waist line. This helps in decreasing the bulge around my tummy area. See the difference. 6. Pay attention to the fabric. Is it drawing attention to every lump and bump? Clingy clothes, spandex type of material that doesn’t flow but hugs your body should be avoided. Find fabrics that skim and slide over your body. 7. Find a hair style that elongates your neck or face, usually bob cuts add too much width to your face so avoid them. Try wearing hair up and off your face. Notice in the picture above, my hair is poofy and all over my face making me look even heavier. In the next picture even though my hair is not up it’s not all over my face, making my face and neck look longer. 8. Find some shape wear that works for your body type. 9. Wear lightweight cardigans or jackets to hide the bulge or doughy arms. 10. Wear heels it makes you look longer. 11. A-line or empire waist dresses graze over the tummy area. 12. V-necks elongate your body. Avoid T-shirts with crew necks especially if you have a thick neck or double chin. This is one thing I am not good at remembering to do, good posture helps you look thinner (I write this as I type hunched over my lap top). What do you do to hide the problem areas? Or to dress thinner? The lovely comparison image above is via Starsandsunshine.com. Since we are discussing fashion here I want to remind you that the chic clothing shop Mikarose was so kind to let me giveaway a $50 gift certificate to their store. Stop by here to enter to win. Wow, thanks for sharing the great tips. Now to incorporate them. Charis, Yes, once you figure out your body type and what areas you want to hide it makes it easier. … and wear LOTS of black, my grandma used to say. No long earrings, and no necklaces that are really close to the neck. Emphasize your cleavage, especially when wearing black- it will draw attention away from unsightly love handles- wear a charm necklace that nestles just above the bit where your breasts start, it makes a lovely focal point without looking slutty. Avoid long coats and skirts when you are short- they make you look even shorter and more chubby. If you have pretty legs, it’s fine to wear a short skirt and boots to emphasize them- just don’t wear anything too tight around the waist area! And most of all- if you know you are pretty, everybody else will know it, too. Love yourself, don’t sell yourself. 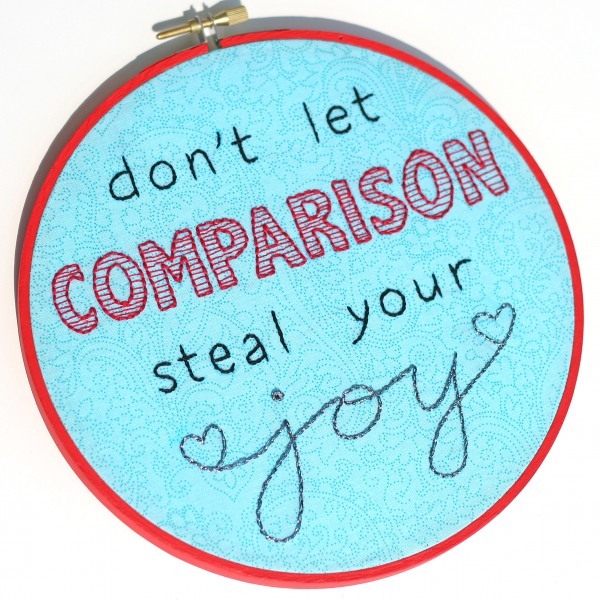 Just because a garment fits does not mean you should be wearing it, but on the other hand, just because you are soft around the edges (like a real woman has to be, who wants to look like the victim of starvation?) does not mean you can’t strut your stuff. Emphasize the bits you like and draw away attention from the bits you are not entirely happy with- and then go and kill ’em, tiger! 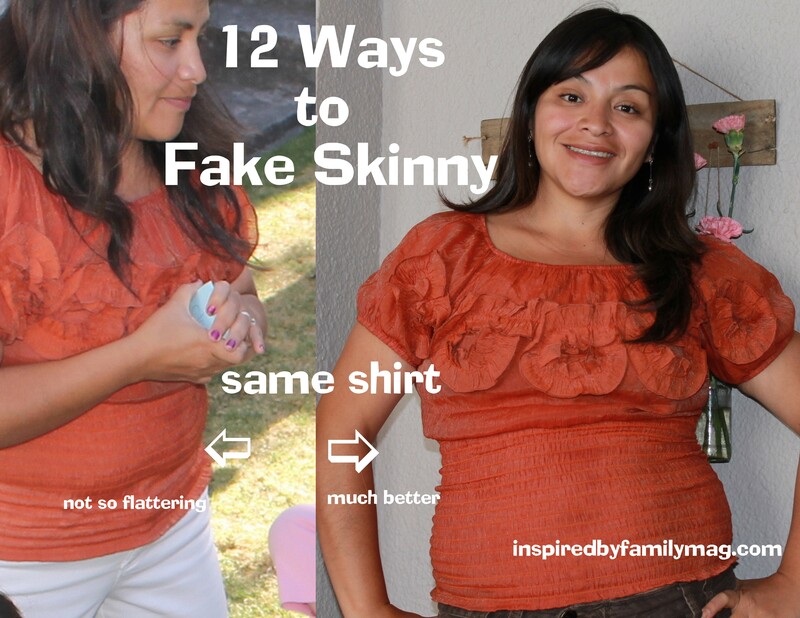 Well when I seen 12 Ways to Fake Skinny I had to head over. I need all 12 ways, and learned some like don’t wear too lose clothes, I do do that. Thanks for the tips. Thanks for sharing your inspiration with Sunday’s Best – you helped make the party a success!